Dollee Kaya (Coconut Spread) is exactly like how Ma Ma use to make it. All natural, it is made from Coconut Milk, Sugar and Pandan (Screwpine Leaves). There is absolutely no added artificial preservatives, flavouring or colouring. Dollee also does not cut corners and there is no added flour unlike some commercial versions of this sweet treat. Dollee Pandan Kaya is a more modern version with a stronger aroma of the fragrant Pandan leaf. 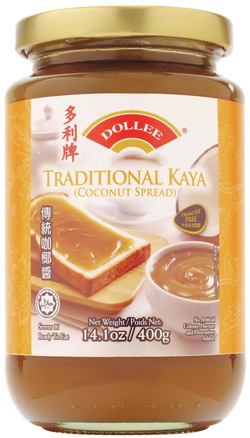 Enjoy Dollee Kaya as a spread (like a jam) on bread, toast, pancakes, waffles and cakes. It is also delicious when used as a filling for buns, pau (steamed buns), sweet glutinous rice dumplings,kuih or other sweet desserts. Dollee Traditional Kaya is a more nostalgic flavour and has stronger hints of Caramel.